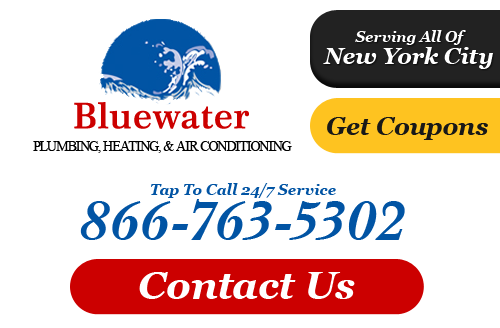 When you need new plumbing installed or replaced in your home, contact Bluewater, Plumbing, Heating, and Air Conditioning. Our certified, knowledgeable plumbing contractors are experienced with all types of installations with popular, high quality products from reputable manufacturers of residential plumbing equipment. We offer same-day service and complete all projects in an efficient manner. We have served numerous homeowners across Queens and the surrounding New York areas, and consistently receive high ratings for our exceptional customer service and first rate plumbing systems. If you want only the best for you home's plumbing then contact us today for plumbing installation in Queens or nearby! Our team of professional plumbing contractors specialize in plumbing installations and replacements for both residential and commercial properties. Our highly trained plumbers in Queens will efficiently implement your brand new equipment and integrate it to work perfectly with your home's current plumbing and sewer systems. Schedule an appointment with us today. We'll make a quick home visit, inspect your plumbing needs and make suggestions for an upgrade or new fixture installation. Our entire team pride themselves on efficient and accurate work. We do it right the first time which saves you time and money, regardless if you are investing in a plumbing update such as copper pipe repiping or a new construction plumbing installation project. We promptly arrived at your door and work fast so that you can get on with your daily routine. 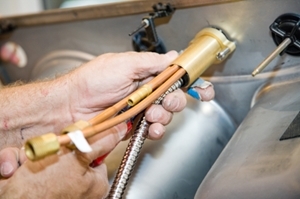 So if you need plumbing fixtures installed or a new water heater replacement, repiping or any other number of plumbing services, remember the skilled Queens plumber you can count on for top quality products and workmanship is Bluewater Plumbing, Heating, and Air Conditioning. Today's water heaters are more efficient, longer lasting and easier to use than the older models. Since hot water heaters use a lot of energy, it's important to find the model that distributes the right amount of water for your home depending on all of the sinks, tubs, showers, and other fixtures in your home and the size of your family. Allow a Bluewater, Plumbing, Heating, and Air Conditioning professional help you discover the options available and choose the perfect water heater for you. Call our expert installers today to schedule for plumbing services in Queens or any of our nearby service areas throughout New York. If you need some type of plumbing installation in Queens or the surrounding areas, please call 866-763-5302 or complete our online request form.